Thus far, the content of this lesson has focused on troubleshooting common operating system problems by using a variety of tools and techniques. In some cases, however, it’s possible that none of these methods works. For example, if critical system files have been deleted or there has been severe file system corruption, these issues might not be easily resolvable. If there’s an issue related to startup configuration, you might not be able to access the startup menu to perform further troubleshooting. One potential resolution is for you to reinstall the entire operating system. Although this strategy will most likely work (except in the case of physical hardware failures), it can lead to a lot of additional effort. For example, you will need to reinstall all applications, add all drivers and system updates, and reset operating system configuration options. Fortunately, there’s a better option that can resolve many common issues. 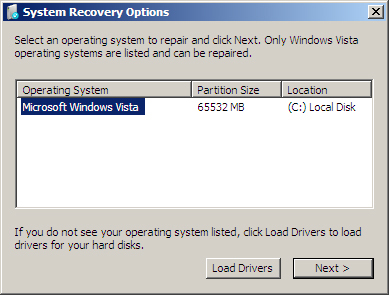 You can access the Windows Vista Repair options by booting the computer, using the Windows Vista installation media. Home and small-business users usually receive this media from either their computer manufacturer (if the operating system came preinstalled) or with their retail purchase of the product. Note that, in some cases, users might need to change the boot preference order in their system basic input/output system (BIOS) or press a specific key during the system startup process to boot from the installation media. The initial screen that loads provides options related to installing Windows Vista. If you wish to start a reinstallation of the operating system. To access repair-related options, click Repair Your Computer. 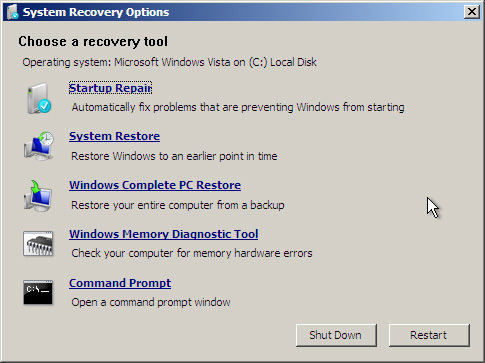 The System Recovery Options dialog box is displayed (see Figure 19). The program attempts to locate automatically any existing Windows Vista installations on the local computer. If no Windows Vista installations can be found, there are two likely causes. The first is that you must load additional drivers for the storage controller or hardware. You can do so by using the Load Drivers command. The other possibility is that the hard disk itself has failed or that the data has been severely corrupted and cannot be read. In these situations, it is likely that you first need to resolve the hardware-related issue and then reinstall Windows Vista. If the operating system does appear in the list, select it and click Next to access additional troubleshooting and repair options. The next dialog box displays a list of available troubleshooting commands and options (see Figure 20). There are several common causes of startup-related issues for Windows Vista. Some of the most common ones involve the deletion of critical boot-related files or improperly configured startup options. 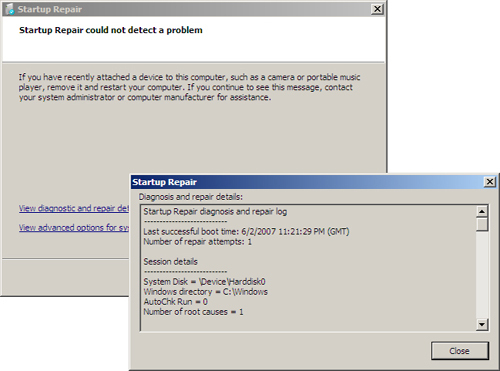 The Startup Repair operation can automatically detect and repair these common configuration issues. The most common types of issues, if encountered, can generally be repaired automatically without any additional user input. Figure 21 shows an example of the results displayed when no configuration problems are detected. The Repair installation process does not include a full operating system, but it does include a basic command prompt feature that enables you to perform a variety of operations. Examples of commands include the ability to list, move, copy, or rename files. 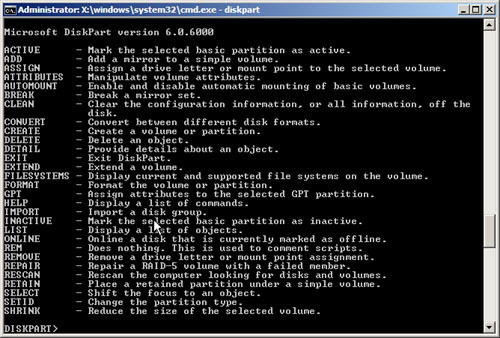 Additionally, it is also possible to use the DiskPart utility to create and manage disk partitions (see Figure 22) and the bcdedit command to modify boot-related settings. Another useful command is the chkdsk utility, which you can use to detect file system errors on the computer. Earlier versions of the Windows platform (including Microsoft Windows 2000 Professional and Windows XP) include a Recovery Console option. This feature enables users to access a command prompt for performing various troubleshooting options. These features are now available to you by using the Repair option when booting from the Windows Vista installation media.  For more information about the specific commands that are available, see the Command-line reference for IT Pros page on the Windows Vista Web site at http://windowshelp.microsoft.com/Windows/en-US/Help/4e7cd306-e9b0-4296-9528-9121d4f9bd111033.mspx.